The latest V625 Series trailer boat design is a new generation planing hull with much greater forward buoyancy and wave riding capabilities giving better sea handling and stability, with a remarkably smooth and dry ride. With a boat, trailer and motor combined dry weight of only 2100kg, it is easily towed and easy to handle both in and out of the water. 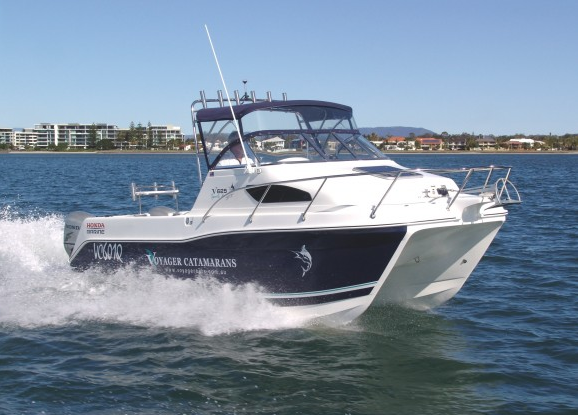 It will suit a multitude of uses from the perfect bluewater fishing platform, to an ideal couples or family Sports Getaway. A choice of either ‘open or lockup’ cabin, incorporates twin single bunks that will convert to a full king size berth. It is also available with various seating combinations, plus optional shower, toilet, sink, cooker or fridge, as well as either canopy or f’ibreglass hard top, with optional storm covers.